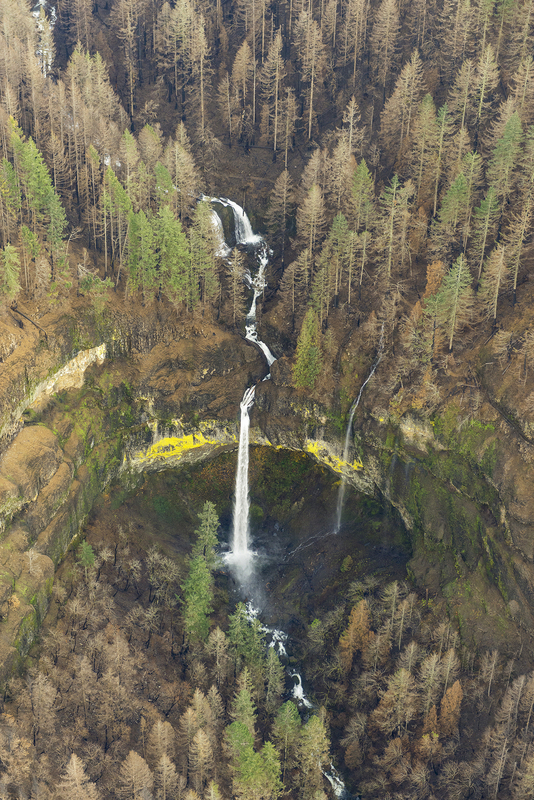 This is the second article in a two-part series that explores a remarkable set of stunning, often startling aerial photos captured by the State of Oregon in early December. 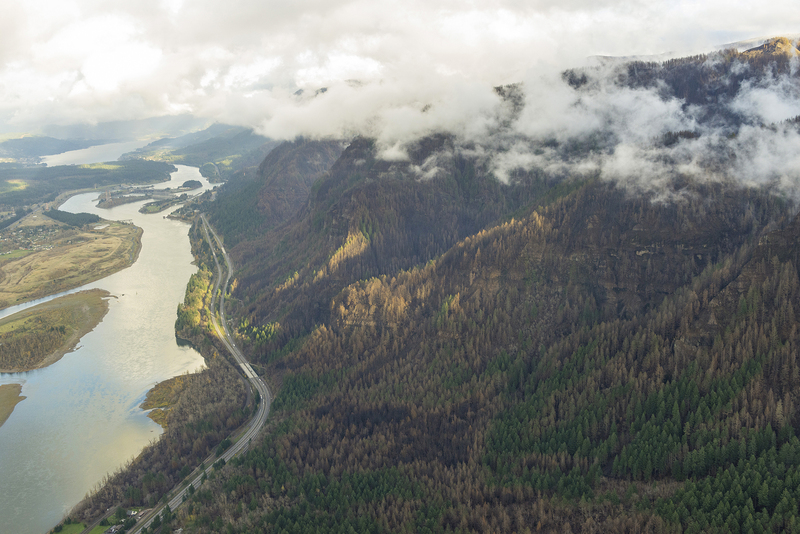 Their purpose was to assess the risks for landslides and flooding from the bare, burned Columbia River Gorge slopes following the September 2017 Eagle Creek Fire. 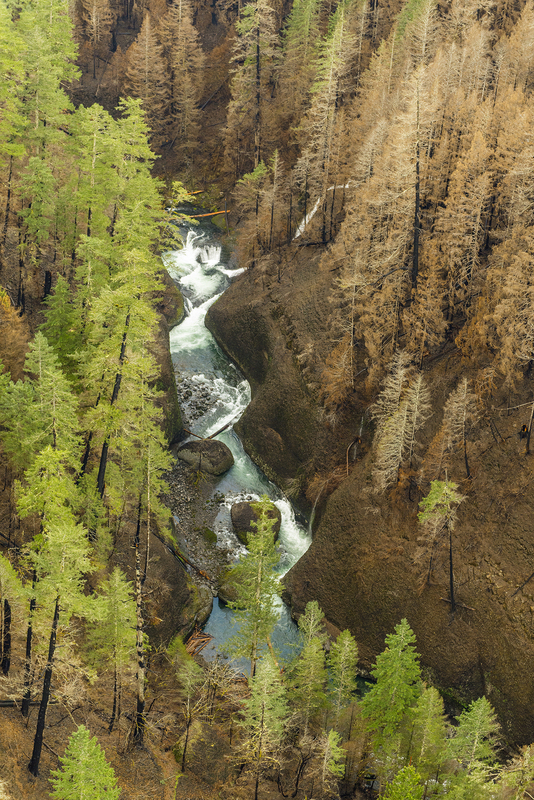 But these amazing photos also provide the first detailed look at the impact of the fire, and for those who love the Gorge, a visual sense of how our most treasured places fared. The first article covered the west end of the burn, from Shepperd’s Dell to Ainsworth State Park. This article covers the eastern part of the burn, from Yeon State Park to Shellrock Mountain. More information on the photos follows the article. This first image in this second part of the series looks east from above Ainsworth State Park, toward Bonnevillle Dam. The Gorge was heavily burned along this stretch, from the banks of the Columbia River at the community of Warrendale to the tall crests of Wauneka Point and Nesmith Ridge. Wauneka Point is notable for its remoteness. Some reach this spot by scaling the ridge from nearly 3,000 feet below, at Elowah Falls, while others follow the faint Wauneka Point Trail from the headwaters of Moffett Creek. This is fortunate, as the rocky outcrop of Wauneka Point also has one of the most elaborate and unusual Indian pit complexes found in the Gorge. Fires here are a regular occurrence, too — photos from the early 1900s show a recovering forest and hundreds of bleached snags along Wauneka Ridge, much as the ridge now appears after the Eagle Creek Fire. 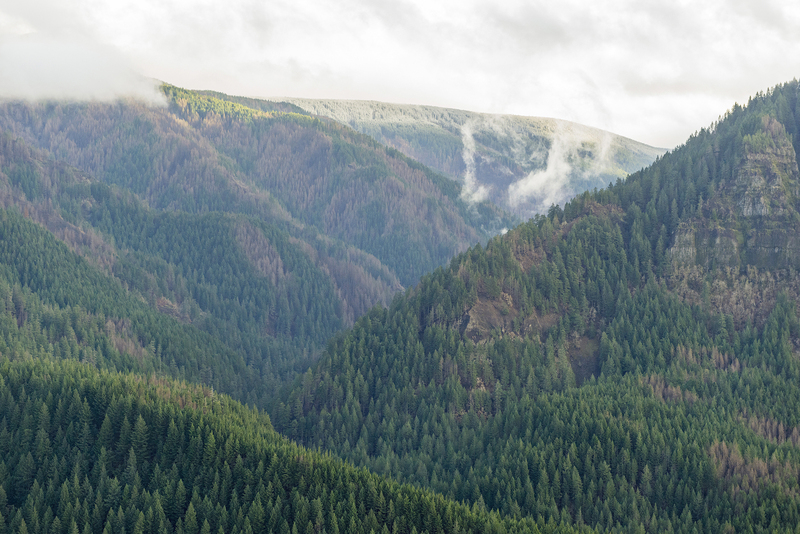 It’s likely that Native Americans living along the lower Columbia River periodically burned these ridge tops to promote huckleberry, beargrass and other sun-loving foods and materials that were gathered in the higher elevations of the Gorge. Another detailed look at this photo helps explain why parts of the Upper McCord Creek Trail were so heavily impacted by debris after the fire. 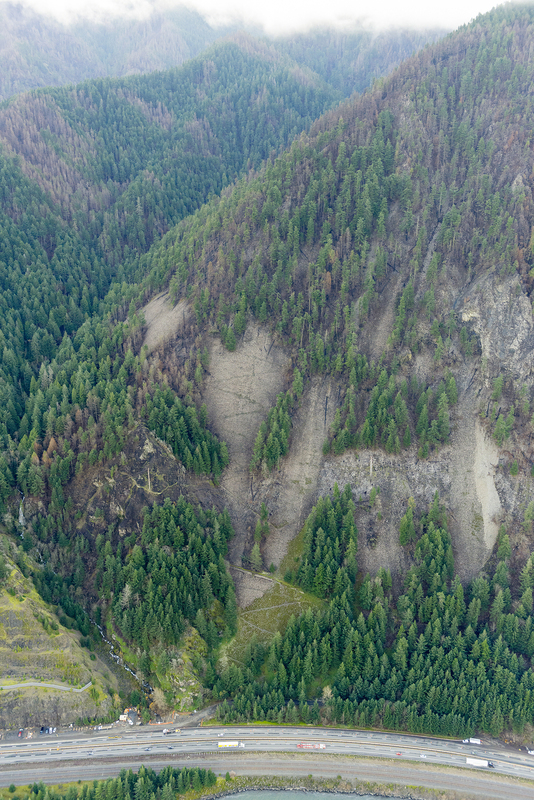 This close-up view (below) shows extensive landslides on the slopes above the trail that have released tons of loose rock and debris onto the section of trail that switchbacks up the slope beneath the cliff band. While slides like these will eventually be stabilized by recovering forests, more debris is certain in the near-term, as the forest understory begins to take hold. 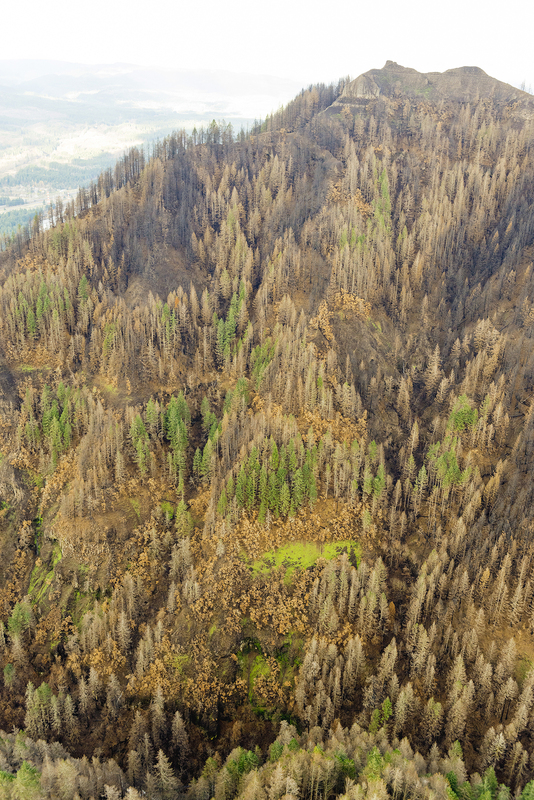 Another detail that emerges from this photo is the widely varied pattern of a “mosaic” fire, from blackened, completely burned forests to green, intact conifer stands that have survived the initial heat and stress of the fire. A closer look (below) at a section of forest that straddles the Nesmith Point Trail shows a heavily burned area in the center, surrounded by surviving forest. Tributary deltas like these are likely to grow significantly throughout the Eagle Creek Burn area in coming years as erosion from burned slopes loads up the creeks with extra rock and gravel. This is another beneficial aspect from the fire cycle, with gravel deltas and debris in streams providing some of the best fish and riparian habitat in the Gorge. 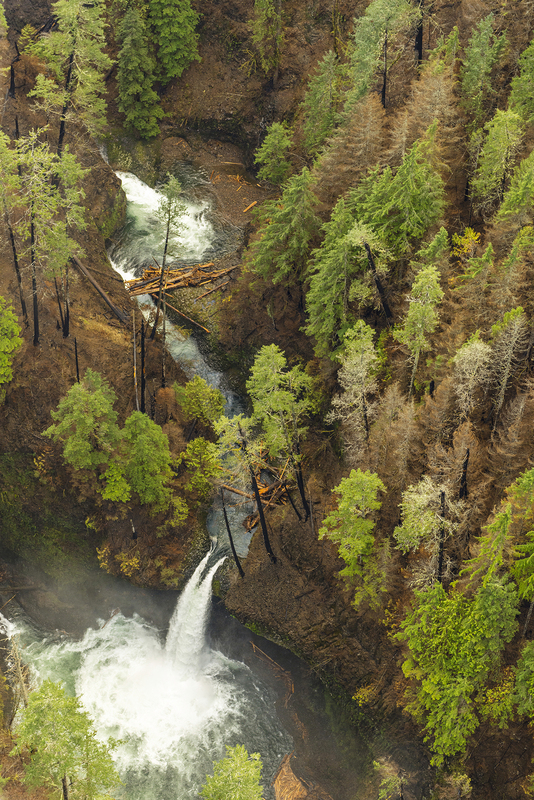 Though much of the McCord Creek drainage was badly burned in the fire, some of the tree canopy survived, especially the tall conifers that grow along the creek below Elowah Falls (below). We won’t know the fate of the beautiful Bigleaf maple groves that line the creek in the lower McCord Creek canyon until later this spring, but it’s unlikely their crowns have survived. Unlike Douglas fir and other conifers, maples lack thick, insulating bark needed to survive the heat of the fire, nor the height to protect their upper branches from the flames. Instead, maples have evolved to simply regrow from their surviving roots after fire, often forming multi-trunked trees with a circle of shoots that emerge from around the skeleton of the parent tree. 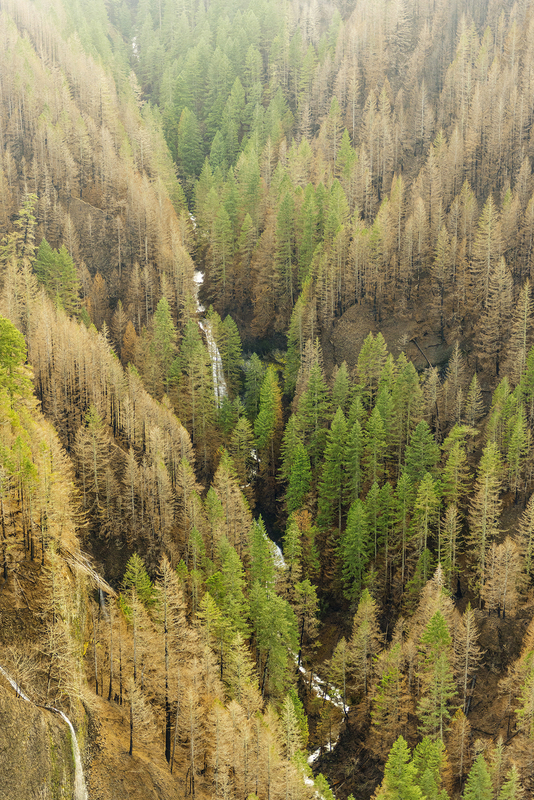 While many riparian strips within the Eagle Creek Burn resisted the fire, some of the steepest slopes along McCord Creek below Elowah Falls (below) were badly burned. The geology of this section of the canyon doesn’t help the cause, as it consists of loose, slide-prone Eagle Creek Formation clays and gravels. 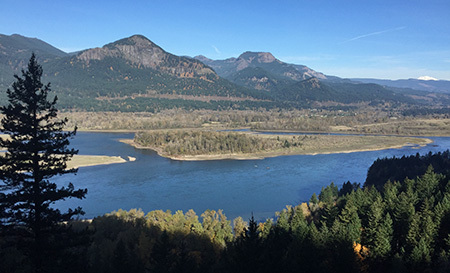 This notoriously unstable formation is responsible for most of the ongoing slides and collapses that occur in the Gorge, including the epic Table Mountain landslide that briefly created the fabled Bridge of the Gods in 1450 A.D., near today’s Cascade Locks. 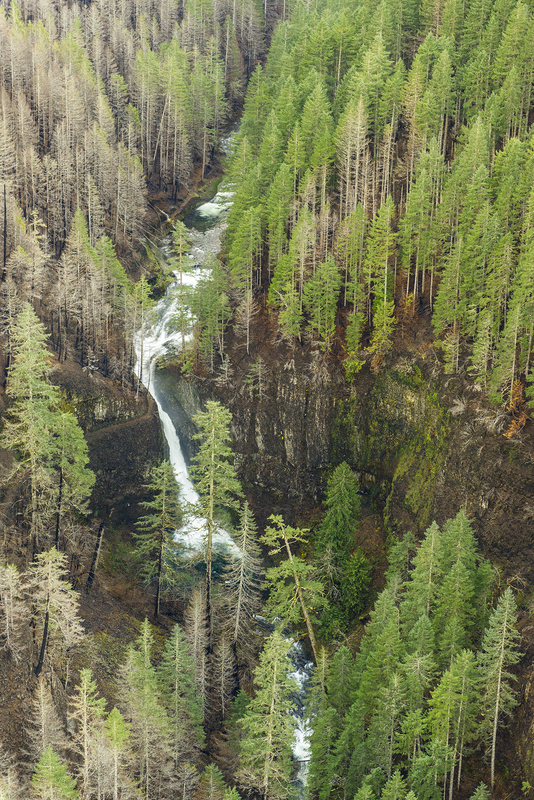 As difficult as it is to absorb these images of devastation from the Eagle Creek Fire in places like this, it’s also an opportunity to watch and learn from the forest recovery that is already underway. While I won’t see tall groves of mossy Bigleaf maples arching over McCord Creek again in my lifetime, many of today’s Millennials will live to see a substantial return of forests across much of the Eagle Creek Burn. Few trees survived in this area, and erosion is severe in several of the small streams that flow into McCord Creek from Nesmith Ridge. Yet, even with the devastation from the fire, signs of the recovery were already apparent in January, just four months after the fire, with new vegetation emerging in the middle of winter. 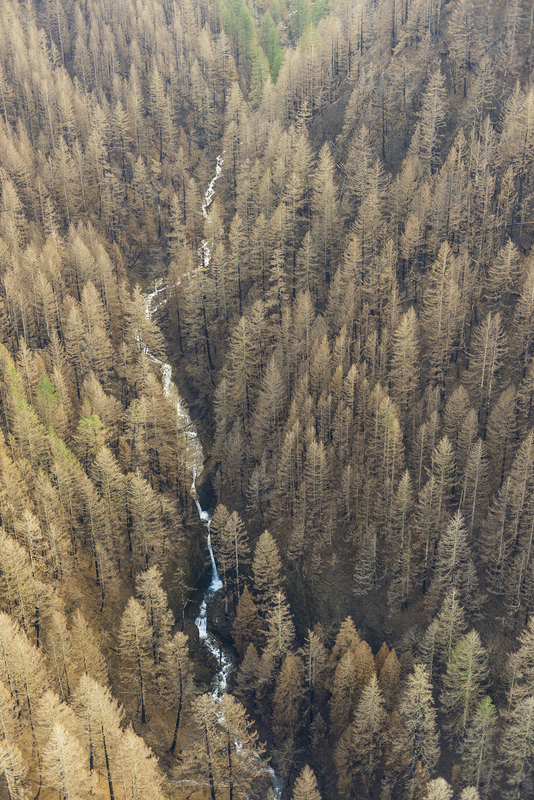 The burned riparian forest along the upper section of McCord Creek included 50-60 year old stands of Bigleaf maple and Red alder, and both species appear to have been killed by the fire. Unlike maple, the alder stands are less likely to regrow from surviving roots, and instead mostly rely on new seedlings. Red alder are uniquely adapted and prolific at this, and are among the first trees to colonize burned or disturbed areas. Still considered a “weed tree” by a timber industry more interested in lumber than healthy forests, these trees (and other pioneering, soil-stabilizing broadleaf species) are still sprayed with herbicides in recovering clearcuts to allow rows of hand-planted Douglas fir seedlings to grow, instead. Yet, Red alder are an essential species in the process of natural forest recovery in the Pacific Northwest. While the big conifers will take many decades to once again tower above McCord Creek, a scene with Red alder framing the creek, like the one shown above, may be just 20-25 years in the future if they are allowed to grow. As an early colonizer, Red alder not only help to quickly stabilize exposed soils, they also serve as a nitrogen fixer, restoring 80-200 pounds of nitrogen per acre through their roots when pioneering a disturbed site. 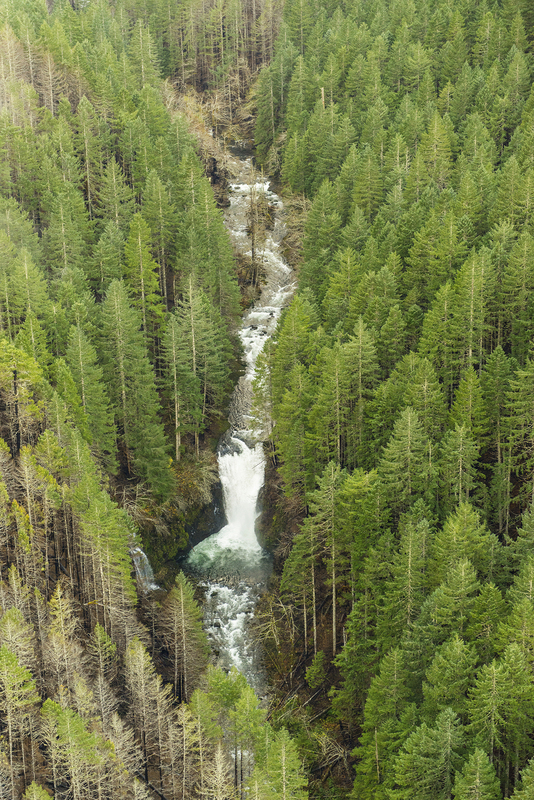 As the forest recovery unfolds in the Eagle Creek burn, these humble trees will stabilize some of the toughest terrain and help other species that follow become established in the rich soil they create. This process may not be the fasted way to grow lumber, but it’s the most sustainable way to ensure the long-term health of our forests. The faint, historic trail to Wauneka Point from the Moffett Creek trail was already in jeopardy of being lost to lack maintenance and use, and sadly, the fire may seal its fate in becoming another “lost trail”. Debris from burned trees will quickly overwhelm the path without some periodic maintenance, something that has not occurred here for many years. The burn provides an opportunity to rethink trails like the one on Wauneka Point, including making new connections to allow hikers to more easily use them from more accessible trailheads along the highway corridor. 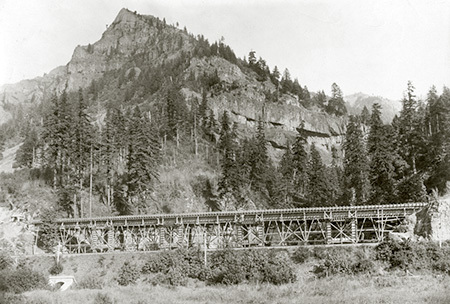 At about the time the original Columbia River Highway was built in the early 1900s, a group of Portlanders proposed a daring trail into Moffett Creek canyon, much like what was built along Eagle Creek at the time, but the project stalled. Today there are no trails into Moffett Creek canyon, though a few visit Moffett Falls each year by following the creek a mile upstream from where the stream flows into the Columbia River. A few more explorers climb farther, to beautiful Wahe Falls, but only the most intrepid explorers have rappelled down the string of 11 spectacular waterfalls hidden in the depths of Moffett Creek canyon. 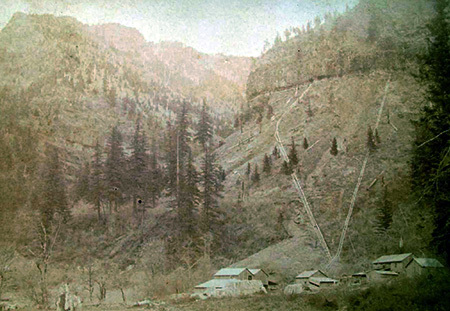 This section of Moffett Creek canyon was heavily impacted by the fire, and most of the forest killed by the flames. The recovery here will go unnoticed by most, though the few who explored this beautiful canyon before the fire will find these images difficult to absorb. Few have ever seen Moffett Creek and few of us were ever destined to because of its remoteness. The canyon will also recover beyond the reach of humans, as it has many times before over the centuries. For a wonderful glimpse into some of the secrets this canyon holds, and a look at the lush beauty before the fire, you can pick up Zach Forsyth’s excellent Moffett Creek book in his “Hidden Treasures” series over here. Munra Point is perhaps the most popular “unofficial” trail in the Gorge — or Oregon, for that matter. While it was once a lightly visited secret, the growing Portland region and advent of social media has turned this steep goat path into an actual zoo on summer weekends. The Forest Service has made no attempt to manage the user trail to Munra Point, as it’s “off the system” and in recent years it has suffered serious damage and erosion as the web of steep user paths has grown here. The burned forest and subsequent erosion on these steep slopes will make it dangerous and unsustainable for hikers to continue to flock to this trail. It’s time for the Forest Service to officially close the unofficial Munra Point trail. The slopes will take decades to recover from the fire, and maybe someday a better-designed trail could be reopened, once the forest has recovered. For now, Munra Point deserves a long rest from our collective hiking boots. Despite being just one ridge away from the origin of the Eagle Creek Fire, the lower Tanner Creek canyon seems to have fared surprisingly well, as shown by this close-up view (below). Some of the largest, oldest trees in the Columbia River Gorge make their home here, and many seem to have survived the fire intact. This view also shows the narrow gorge above Wahclella Falls, where little-known Swawaa and Sundance falls are located just upstream along Tanner Creek. The wide view also shows how much more severely the upper canyon burned, above the waterfalls. In past articles, I’ve proposed extending the Tanner Creek trail to this string of upstream waterfalls, but it’s unclear if the fire will open new opportunities for trails or slow down efforts to build them. There will be pressures in both directions within our public land agencies and among Gorge advocates. My hope is that we can build new trails while the terrain is relatively open and it’s relatively easy to survey, plan and build new routes. This will come as relief to many, though we’ll only know the long-term fate of these survivors after they have endured a couple of summer drought cycles. The fate of the groves of Bigleaf maple and Oregon white oak (below) that also thrived here is less certain. We’ll know in spring when deciduous trees begin leafing out. This close-up (below) of an unnamed rock outcrop and talus slope on the west wall of the canyon shows another potential benefit of the fire. Among the signature habitats in the Columbia River Gorge are the many remote talus slopes that support unique species, and in particular, the Pika. These tiny relatives of rabbits live exclusively in talus, and the Gorge is home to the only known low-elevation population in the world, as Pika typically live in subalpine talus. Assuming low-elevation Columbia Gorge pika living in talus slopes like these survived the fire, itself, the effect of burning off encroaching forest is a long-term benefit for these animals by preserving the open talus and promoting growth of sun-loving grasses, wildflowers and huckleberries that Pika depend on. Another larger species that might benefit from cleared talus and ridge tops is the mountain goat — if it is reintroduced here, or migrates from where it has been re-introduced elsewhere. A 1970s effort to bring them back to the Columbia Gorge was not successful, but perhaps now is the time to try again? If you’ve traveled through the Columbia Gorge since the fire, you have probably noticed the protective fencing above the Tooth Rock Tunnel and fresh stumps where burned trees were cut by the highway department to prevent them from falling onto the highway. And so the ongoing struggle to find passage around Tooth Rock continues, as the successive roads, rails, tunnels and viaducts making their way around and through the rock over the past 150 years may all share a common fate if these landslides continue to grow. 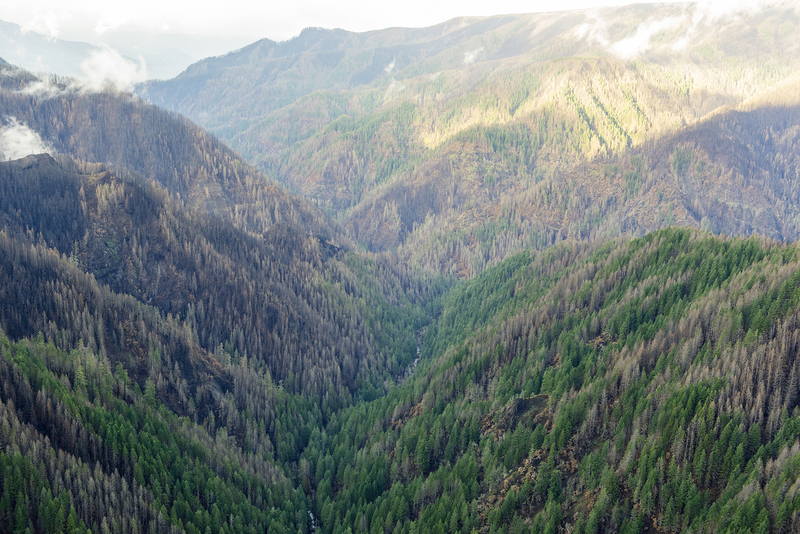 The intensity of the fire damage to the forests in Oneonta, McCord and Tanner creek canyons might lead you to think the Eagle Creek canyon would have fared worse, since the fire was started here. 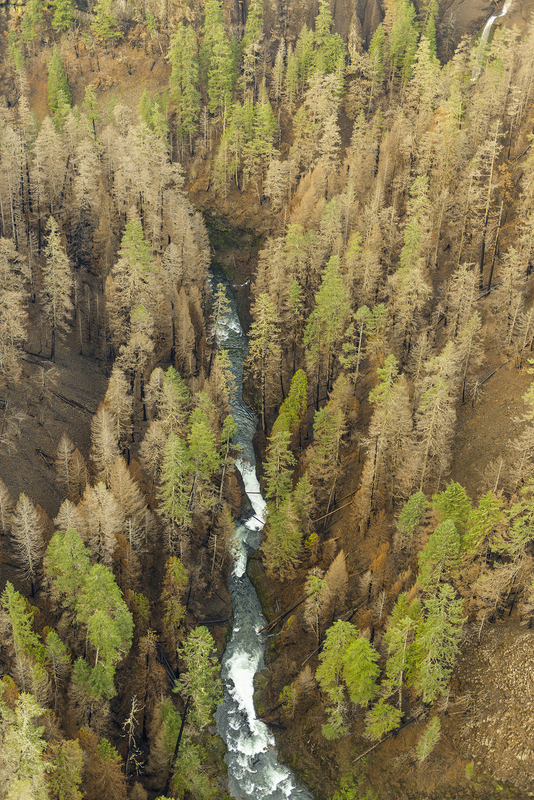 But the State of Oregon aerial photo series shows the forest canopy in many of the most treasured spots along Eagle Creek surviving the fire, with many areas having a beneficial, mosaic burn pattern. The next photo in the series jumps two miles upstream along Eagle Creek to Metlako Gorge, so the extent of the burn in the intervening section of the Eagle Creek Trail is still only known to Forest Service rangers who have been busy assessing trail conditions in the burn area. In this earlier blog article, I covered the landslide event in detail, but the new aerial views provide a much more complete understanding of the full scope and scale of the collapse. 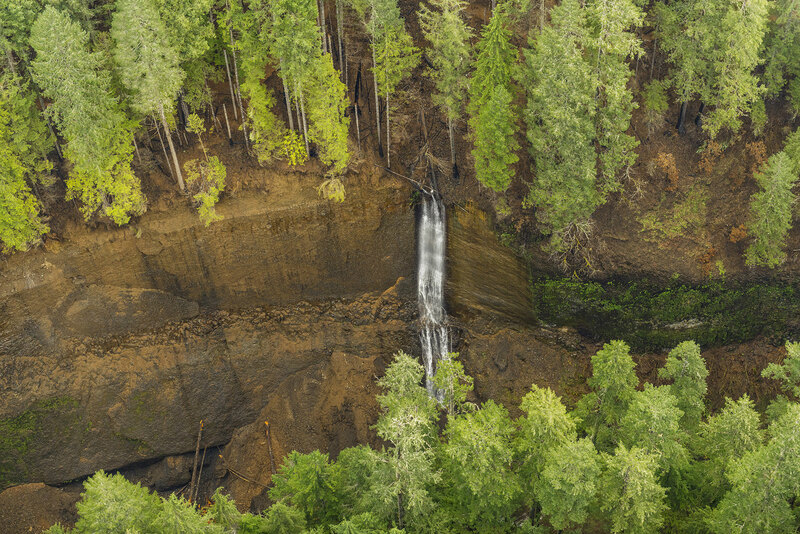 A closer look at this new waterfall (below) shows that the entire stream actually emerges at the brink of the falls, where groundwater flowing beneath the forest surface has reached the solid basalt layer and is forced toward the cliff. Constant hydraulic pressure and occasional freezing where this underground water source seeped into cracks in the basalt layer and the sheer weight of the vertical cliff pulling outward created the conditions for what is a fairly regular event in the Columbia River Gorge: outer layers of exposed basalt cliffs calving off as the elements pry them loose. A closer look (below) at this photo shows that the fire completely burned away the understory around the falls, and many of the trees here are clearly struggling to survive. Soils in the rocky Columbia Gorge canyons are thin and competition is fierce among big trees during summer droughts, so we won’t really know how trees with this degree of fire damage will fare for another year or two. As I worked my way through the hundreds of photos in the State of Oregon series, I expected to find a shot of Punch Bowl Falls similar to the previous view of Metlako Falls. After all, Punch Bowl is easily among most photographed spots in the Columbia Gorge (and Oregon), second only to Multnomah Falls. But after my first pass through the set, I was disappointed not to find a good view of the Punch Bowl, of all places! The good news from this photo is that several stands of big conifers immediately around Punch Bowl Falls not only survived the fire, but look to have completely dodged the flames. 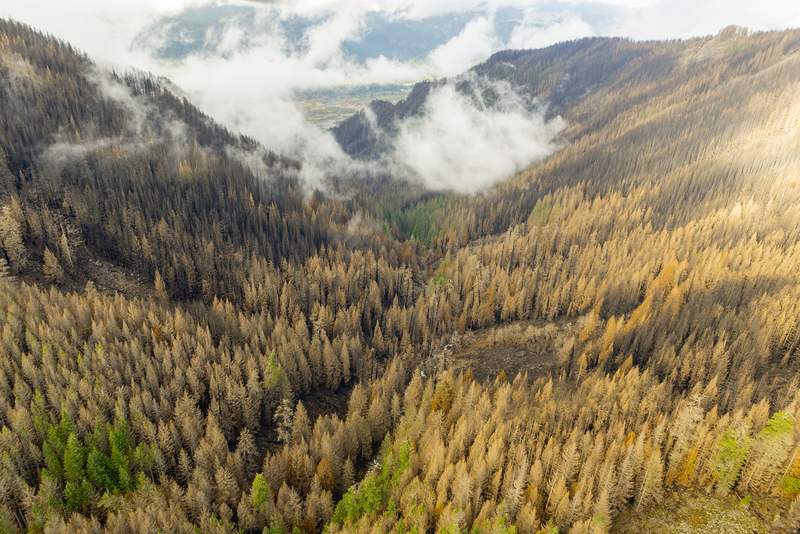 That would be good news, as these trees may now live to grow for another century or two, helping the surrounding burn recover and passing along their survivor genes in the process. Eagle Creek was clearly a barrier for the fire in this area, with the west (right) slopes near Loowit Creek completely burned, while the forest canopy on the east slope (where the Eagle Creek Trail is located) seems to have mostly survived, but with burned trunks to show for it. 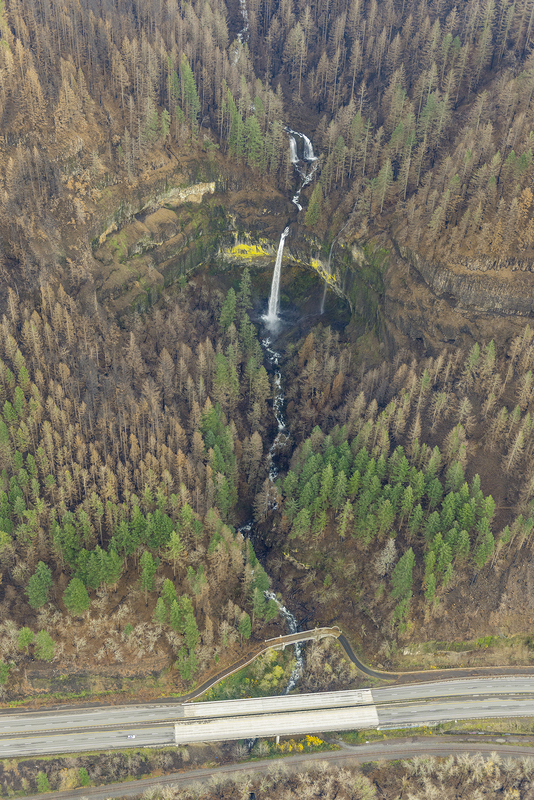 Upper Loowit Falls fared worse (below), with the entire forest killed by the fire. In recent years, the word has gotten out on the relatively easy off-trail route to this falls, so like Middle Oneonta Falls, this might be a good candidate for formalizing a spur trail. This could be done as part of restoring the overall trail system at Eagle Creek, when trail planners can see the terrain as never before, and have the opportunity to provide more hiking options in this popular area. Benson Falls could be another candidate for a short spur trail as part of restoring the Eagle Creek Trail in the burn area and providing new trail opportunities. Eagle Creek formed another firebreak here, though in the opposite direction from what previous photos showed at Loowit Gorge. Here, the forest canopy on the west (right) side of the canyon appears to have mostly survived, while the east side canopy was mostly killed by the fire. These trees are unlikely to weather summer drought stress in coming years as they attempt to survive with only portion of their crowns intact. As will be the case throughout the burn, debris from heavily burned slopes like this will continue to slide onto adjacent trails until the forest understory has returned to stabilize the soil. This will likely play out for several years. 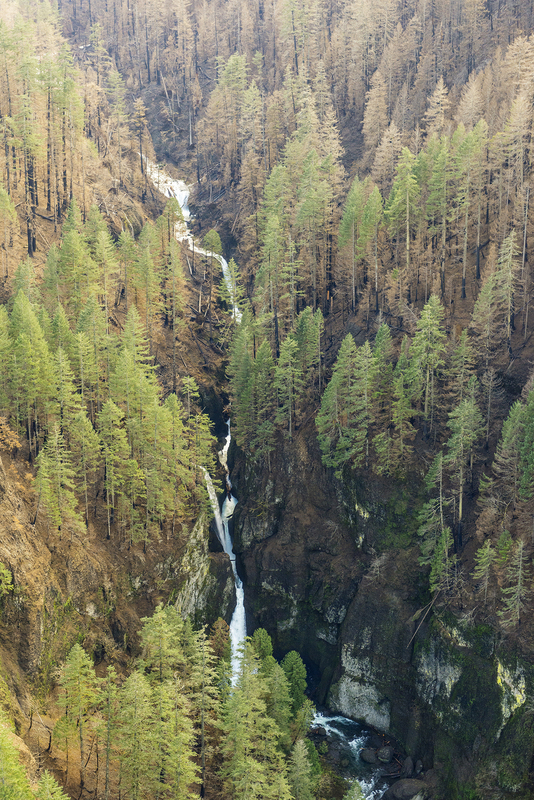 Like the big trees that survived by Punch Bowl Falls, these giants will help the surrounding burn recover by helping to reseed burned slopes and providing shade to help keep Eagle Creek cool in summer and early fall. 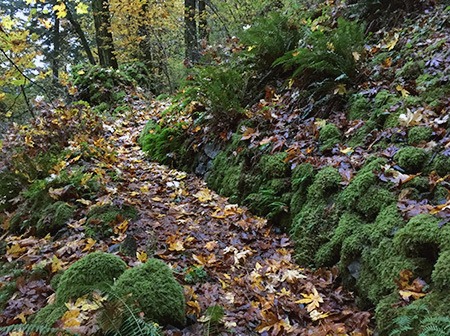 The condition of trails in this part of the Eagle Creek network is unknown, as the Eagle Creek fire merged with the earlier Indian Creek fire in this area. 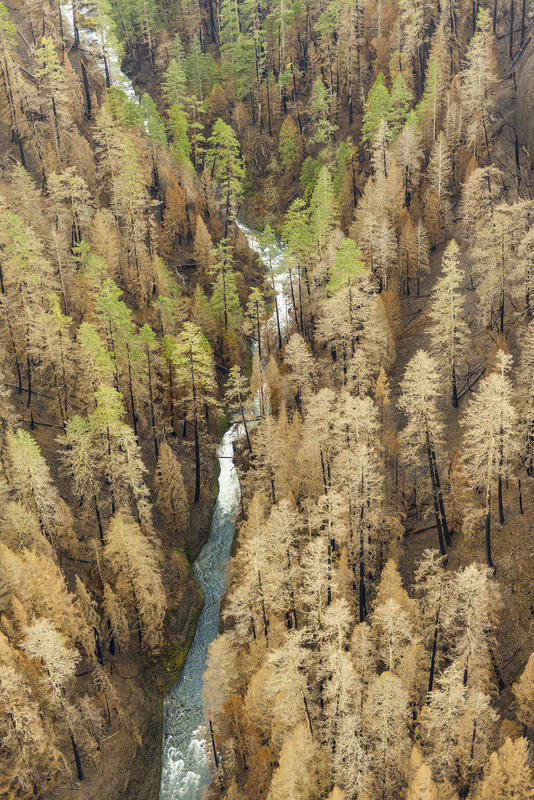 The Indian Creek fire started weeks before the Eagle Creek fire, but spread less aggressively, mostly burning in relatively high elevation areas above the canyon floor. 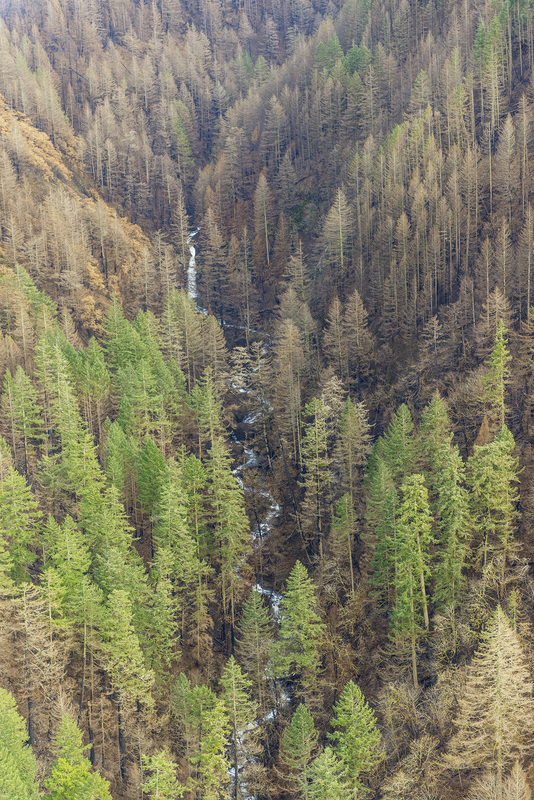 From this limited view, the pattern seems similar to Eagle Creek: killed forests along ridge tops, mosaic burn patterns closer to the canyon floor and some of the largest conifers surviving along Herman Creek (below). The amazing photo survey ends here, roughly coinciding with the eastern extent of the Eagle Creek Fire. 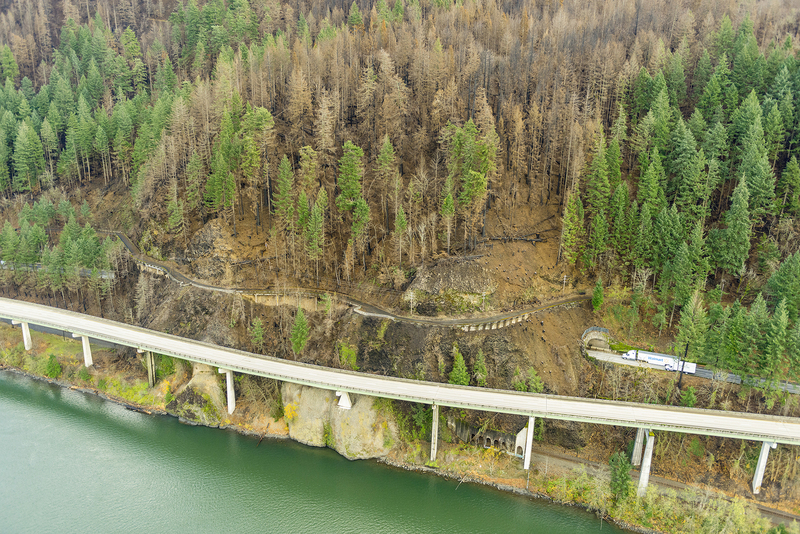 Though the photos were focused on assessing potential impacts of burned slopes on highways and other infrastructure in the Gorge, they also serve as an invaluable snapshot of conditions as they existed immediately after the fire. 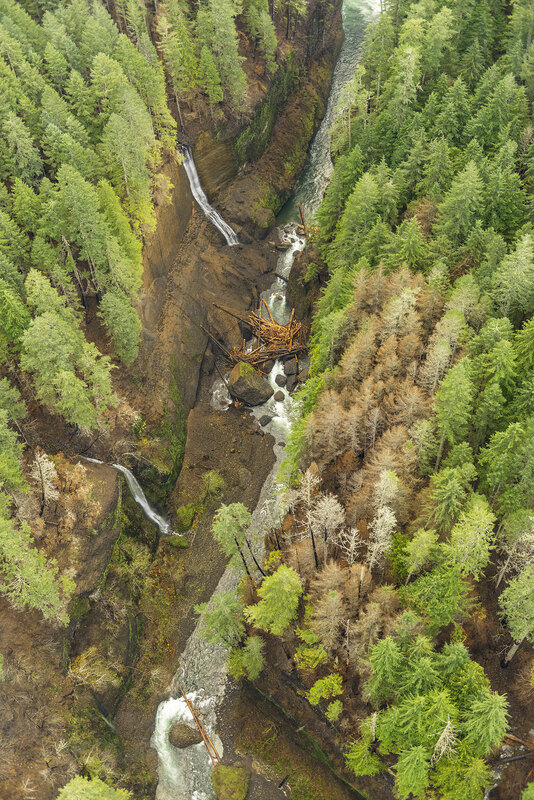 These images will give future land managers and researchers a highly detailed benchmark for tracking the recovery of the Gorge ecosystem over coming decades. While simply restoring the historic trail network will be a big job, the reality of growing demand in our region for new trails and experiences in the Gorge didn’t go away with the fire. These photos also provide a unique opportunity for today’s State Parks and Forest Service planners to consider new trails and trail realignments while the terrain is easy to survey and trail construction more straightforward than when the understory is intact. The fire has created a once in a century opportunity to rethink the trails in the Gorge with our rapidly growing population in mind, and is an opportunity that should not be missed. It also provides an opportunity to link the responsible expansion of recreation opportunities to the forest recovery, itself, allowing hikers to watch and learn as a new forest grows here. Those who love the Gorge already know this unfortunately sequence of events: the Eagle Creek Fire began on September 2, 2017, when a Vancouver teenager tossed illegal fireworks into the canyon from cliffs along the Eagle Creek trail. The fire quickly exploded into an inferno, burning more than 48,000 acres along the Oregon side of the Columbia River Gorge, and briefly igniting a small fire on the Washington side when embers floated over to the slopes of Aldrich Mountain. This month, a Hood River County judge sentenced the teen to five years of probation and 1,920 hours (48 weeks) of community service with the U.S. Forest Service. That’s more volunteer time that many Americans contribute over a lifetime. Much of that work will be in the form of restoring and rebuilding trails damaged by the fire, no doubt, and hopefully this mandated service will inspire the unnamed teen to dedicate his life to protecting our public lands after this tragedy. I fall into the second category in my own reaction, and don’t see a reason to destroy a young life because of a mistake that went horribly wrong. Most of us made similarly stupid decisions in our teens, and were simply fortunate enough not to have had consequences of this scale to answer to. I also see this sequence of events as a metaphor that all who love the Gorge can learn from: today’s kids are increasingly isolated from nature and spending time on our public lands. Learning to understand, appreciate and respect nature is something that all kids should experience, and might have prevented the Eagle Creek Fire, too. The teen who started the Eagle Creek Fire will spend nearly a year in his young life working to help with the recovery effort as part of his sentence and will surely learn these lessons. But what if all kids in our growing region simply spent a few hours working on a trail or helping to restore the burn in some other way? How would that change the way in which future generations care for the Gorge? 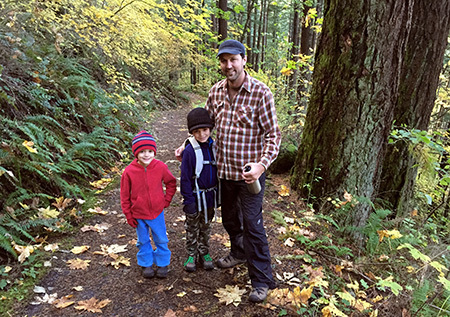 How could we all help to bring out youth closer to nature as we work to restore the Gorge? 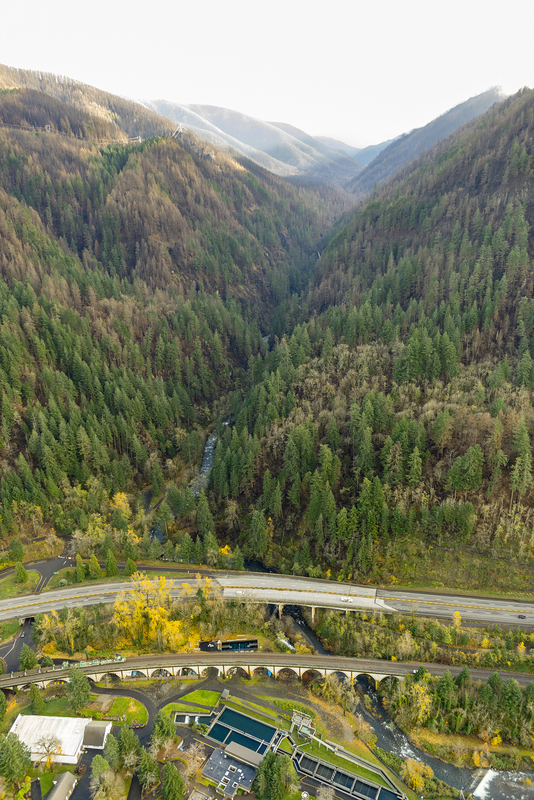 Reactions to the first in this two-part article ranged from sadness and anger over places lost to the fire to a degree of hope and guarded optimism about the opportunity to rethink how we manage the Gorge in the future. 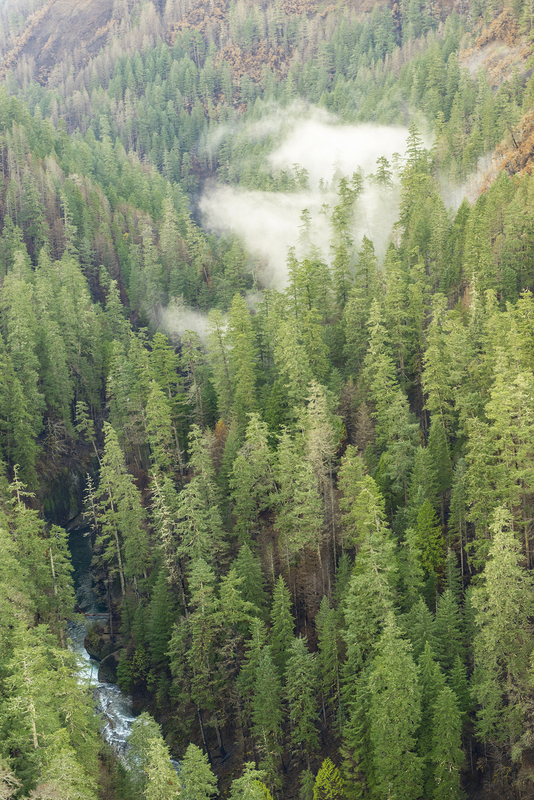 While the full impact of the Eagle Creek Fire is still being assessed, the best option moving forward is to embrace the reality of the burn as an opportunity to learn, grow and pitch in. That’s something we can all do, including supporting organizations like Friends of the Gorge and Trailkeepers of Oregon (TKO) who will be at the forefront of bringing volunteers to the major job of restoration. So far, the public response has been overwhelming, with several TKO trail events filling up almost immediately this year, and long waiting lists forming for future events. That’s encouraging! Let’s hope it continues, as the recovery will take many years. Many will continue to grieve the magnificent forests and idyllic landscapes lost to the fire, too. That’s a very human response to losing a place that is home to so many of us. But it’s also true that the recovery has already begun, and that each year in the recovery process will bring new opportunities to learn and appreciate how the Gorge ecosystem has recovered countless times from fire over the millennia. For those of us at (or past) the middle of our lives, our memories of what was will have to fill some of the void we feel. But younger visitors to the Gorge will see whole new forests grow among the bleached snags that will soon mark much of the burn area, and the very youngest visitors will live to see tall forests grow here, again. What will the recovery look like? The 1991 Multnomah Falls Fire gives us the best glimpse into what to expect as the Eagle Creek recovery unfolds. For those who were around in 1991, the Multnomah Falls Fire swept from the falls west to Angels Rest, scorching much of the Gorge wall along the way. I’ve included a few photos of the burn area taken in 2004, just 13 years after the fire. At that point in the recovery, trees killed by the 1991 fire still dominated the landscape, but a young forest seemed to be exploding from the burn area, with conifers already 10-15 feet tall and growing quickly. Today, some of these trees are twice that tall, and on the way to becoming a mature forest canopy. 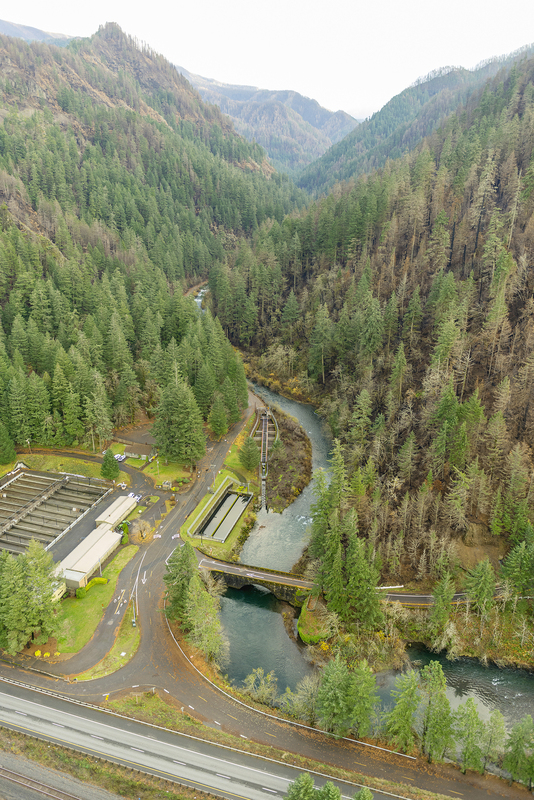 It shouldn’t be a surprise to discover that the Gorge ecosystem can recover quickly and without our help. But with thousands of people living in the Gorge and millions visiting each year, we will also need to learn how to accept fire as part of the forest cycle if we hope to avoid catastrophic burns like the Eagle Creek Fire in the future. What will that take? One essential tool will be prescribed burns. These are purposely set fires designed to burn a relatively small, controlled area with a relatively cool fire that most of the forest canopy can survive. The goal of a prescribed burn is a mosaic pattern like those found in parts of the Eagle Creek Burn where the fire intensity was less and allowed most trees to survive. Prescribed burns are typically set in late fall, when humidity is high and the rainy season is near and can be counted on to completely extinguish the fire. 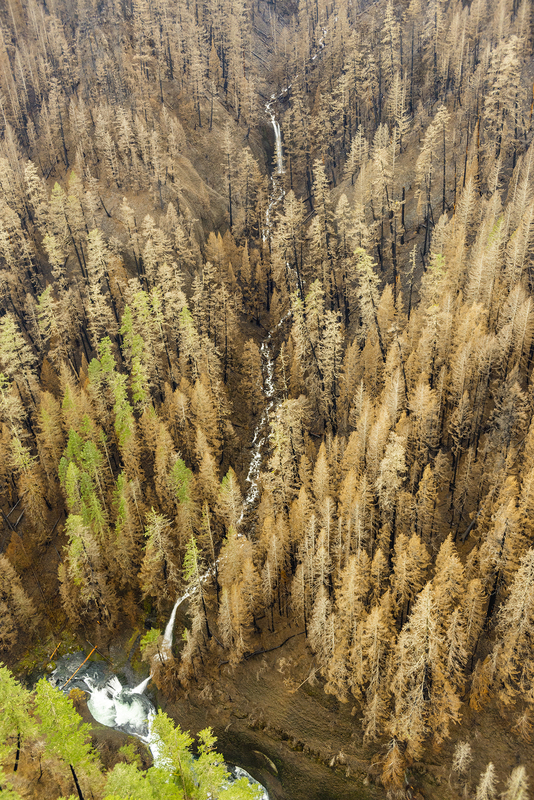 The Eagle Creek burn occurred in late summer when humidity was low, the forests very dry after two months of drought and the first substantial fall rains were weeks away. The famous Gorge winds only added to the volatility. These conditions combined to allow the fire to burn hot and spread for weeks. Prescribed burns are now an accepted forest practice, and increasingly used by the Forest Service and National Park Service to reverse the harm done by a century of fire suppression. But preventing future fires on the scale of the Eagle Creek Fire will also require all of us to accept limits on how we use the Gorge. This may be more difficult to accept than prescribed burning, especially given the patchwork of public agencies responsible for managing the Gorge. What sorts of limits are needed? Restored trails in the burn area will be vulnerable for years to come, and subject to more damage if the same level of foot traffic experienced before the fire is allowed to return. 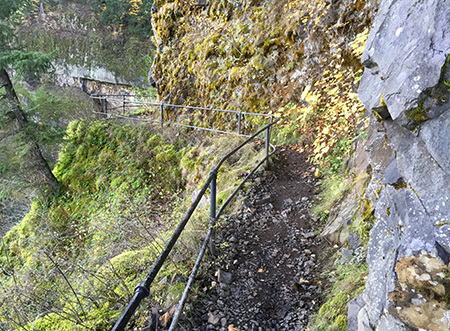 The public agencies that manage the Gorge will need to define and identify reasonable carrying capacities for the most popular trails, and enforce access limits with trail-specific permits, parking management and by offering new trail options for a growing region. Seasonal limits may be required, too. The Gorge was a tinderbox waiting to burn last September when the Vancouver teen tossed fireworks into the Eagle Creek canyon, starting the fire. But it could have easily started from an untended campfire or careless smoker, too. In the future, seasonal trail limits and temporary closures should also be considered when fire conditions in the Gorge are especially dangerous. 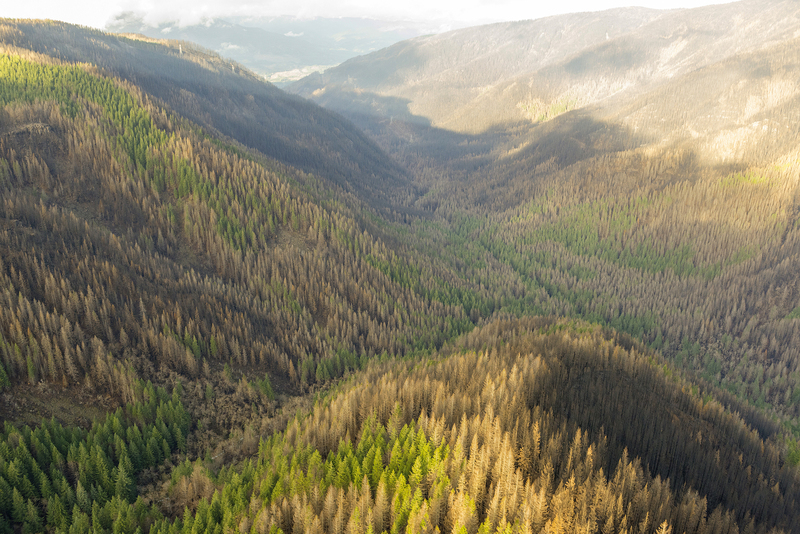 This could not only help prevent overly destructive burns in the forests that still remain, but also acknowledges that thousands of Gorge residents and their homes were also threatened by the fire. Their safety should be a core consideration in deciding when to close Gorge trails because of fire risk. Changes to current management practices will be hard to bring about with a reluctant public, but the Eagle Creek Fire might have given us the perfect moment to educate ourselves on the need to change our ways and think about how our impact on the Gorge will play out for future generations. While much was lost in the fire, we’ve also been given a unique opportunity to change course for the better. I’m optimistic that we will! I chose the above, hand-colored photo to close this two-part article, as it provides needed perspective of our place in the broader cycle of life in the Columbia Gorge. 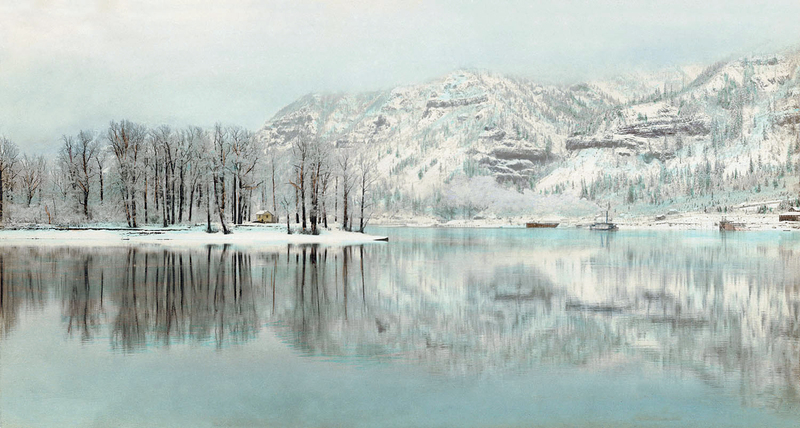 This Kiser Brothers image was taken in 1903 from a spot just downstream from Beacon Rock, on the Washington side of the river. Across the still, reflective Columbia, the cliffs marking McCord Creek canyon can be seen, with the snow-covered slopes of Nesmith Ridge and Wauneka Point rising above. 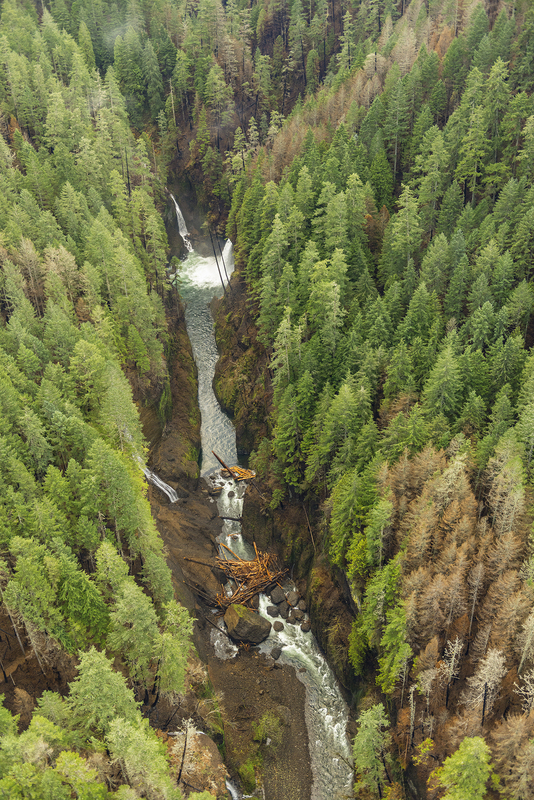 In 1903, the Oregon side of the Gorge was just beginning to recover from an extensive fire that swept a good portion of what we now know as the Eagle Creek Burn. Past is prologue, and this is what the Gorge will look like in our immediate future, as another burn cycle unfolds. While it’s very different scene than the green forests we have enjoyed, it’s also undeniably beautiful in a rugged, wild way. The fire is part of an essential cycle, and more importantly, an opportunity for all of us to rethink how we care for our Gorge. 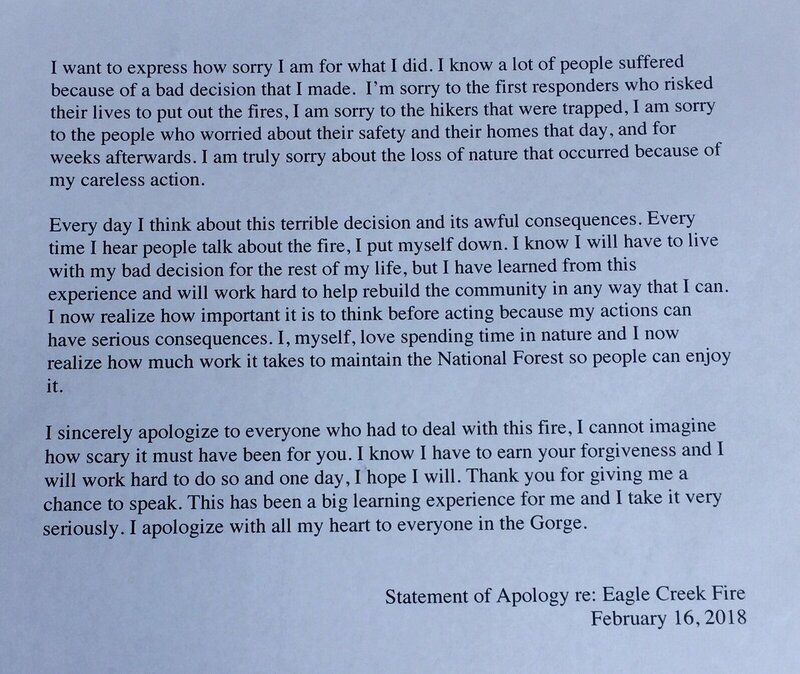 I’ve also included a link to a large version of the Kiser Brothers photo, and encourage you to print a copy to hang on a bulletin board or your refrigerator as part of learning to embrace the Eagle Creek burn. This snapshot from the distant past has helped me begin to embrace the new reality of the Gorge, and I hope will help you, too. Author’s note about the photos: a friend of the blog pointed me to the amazing cache of photos featured in this two-part article, and while you could probably acquire them from the State of Oregon, I would encourage you to let our public agency staff focus their time on the Gorge recovery, not chasing down photo requests. With this in mind, I’ve posting the very best of the photos here, and have included links to very large images for those looking to use or share them. These photos should be credited to “State of Oregon” where noted in this article, not this blog. They are in the public domain. 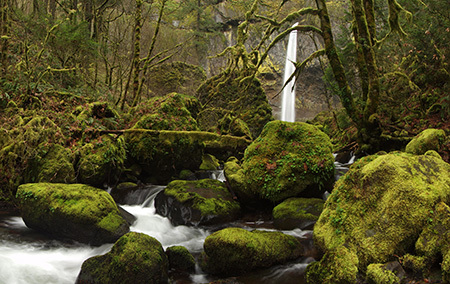 Beautiful McCord Creek boasts a pair of impressive waterfalls that are among the most photogenic in the Columbia River Gorge. 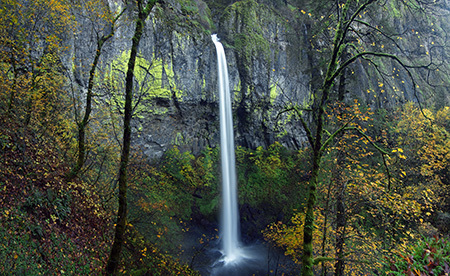 The falls are tucked into John B. Yeon State Park, a lesser-known park located about halfway between Multnomah Falls and Cascade Locks. The rustic CCC-era trails to McCord Creek’s waterfalls have been “discovered” in recent years from spring through fall by crowds of weekend hikers. Yet, the area is surprisingly un-crowded during the wet winter months, from late fall through early spring, and the muted winter tones are just as beautiful. The area also has a long and fascinating human history that is on display throughout the hike, if you know where to look. This article provides a guide to both the trail and the history of the McCord Creek area. The human history in this part of the Gorge stretches back thousands of years, as the river was home to a thriving culture of Native American peoples. The Upper Chinookan people of the Columbia River Gorge fished the legendary autumn salmon runs and picked huckleberries and other wild fruits and forage before moving away from the river during the often harsh winters that we know so well today. An especially elaborate example of the mysterious stone pits thought to be built by native people for ceremonial purposes can still be found high above McCord Creek, on Wauneka Point. White settlement came to the Gorge in the 1800s, and ushered in an era of profound tragedy for the native people, with epidemics of measles and other European diseases decimating native populations, and white settlement displacing native peoples from places they had inhabited for millennia. It’s an uncomfortable reality to confront today, but also important to never forget as we try to understand our history. White settlers were equally destructive for the land and natural resources, as well. In a matter of a few decades, the Gorge slopes were almost completely logged of ancient forests and giant fish wheels built along the river were part of the commercial overfishing that nearly collapsed the salmon runs that had sustained Native Americans here for thousands of years. Frank Warren was among the prominent industrialists operating fish wheels to supply a cannery he built at Warrendale. Today, only a residential district by that name remains to mark the site, just downstream from McCord Creek. In the heyday of the Columbia River canneries at the turn of the 20th Century, canned salmon from the Warren packing company was exported around the world, and Columbia River canned salmon was as ubiquitous as cans of tuna are in our supermarkets today. 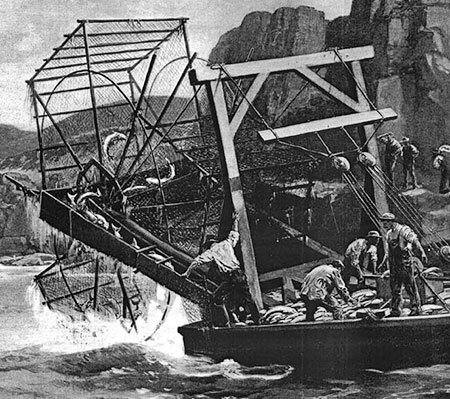 But overfishing by gill nets, fish traps and fish wheels nearly destroyed the salmon runs. Fish wheels were finally outlawed by the 1930s, as the canning industry on the Columbia continued its decline. The last salmon cannery on the river closed in the 1970s. 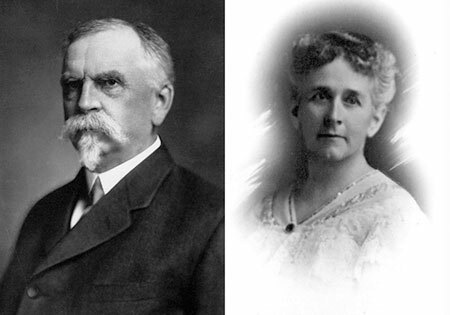 Warren’s packing business made him a millionaire, and he and his wife Anna celebrated their 40th anniversary in style with a 3-month European tour in 1912. For their return trip, the Warrens reserved a first-class stateroom on the maiden voyage of the RMS Titanic. Anna Warren’s riveting account of the Titanic disaster in April 1912 was featured in the Morning Oregonian twelve days after the incident, creating a local sensation. Her tragic story recounted how her husband Frank helped her onto a lifeboat, with Anna assuming he had followed her in. Instead, when she looked back, she saw Frank helping other women into the boats. At the time Anna Warren’s account was published, Frank Warren’s fate was still unknown, but he was later identified as among the more than 1,500 who perished that night. Anna Warren was one of just 710 survivors of the disaster. At about the same time that Frank Warren was operating his Warrendale cannery in the late 1800s, another settler by the name of Myron Kelly was operating a small pulp mill near McCord Creek. Kelly’s mill used a pair of 400-foot long, riveted steel penstocks to power the pulp manufacturing. Though the mill is long gone, portions of the penstocks still survive. They are clearly visible in the 1890s view of the mill, above. 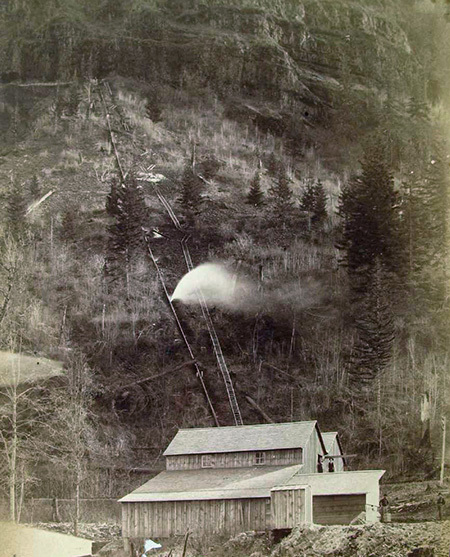 The penstocks were fed with water from McCord Creek, diverted from above the waterfalls, and routed to the penstocks along the cliff-top ledge we now use as a hiking trail. Kelly used a natural break between basalt layers to blast out the ledge, and hardware from the pipe system is still found throughout the cliff area today. Black cottonwood trees — the same we see lining the river today — provided the raw material for making pulp. 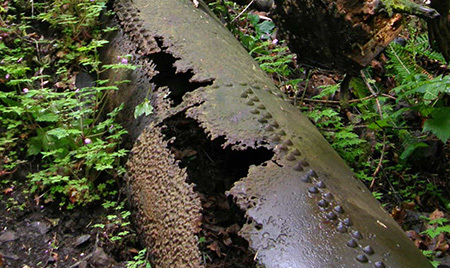 Surviving portions of the two penstocks are prominently crossed by the trail to Upper McCord Creek Falls, along with other relics sprinkled through the forest. The large wood water cistern located near McCord Creek trailhead is not from the Kelly pulp mill era, surprisingly, and was added later to supply water to area homes. 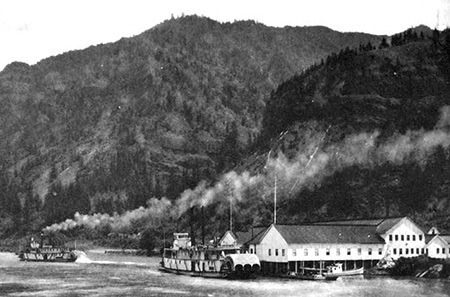 The early industrial settlements in the Gorge relied on railroads and ships for transport, as there was no road until the early 1900s. 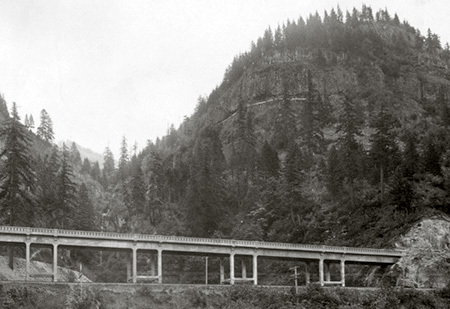 That changed in 1916, when the new Columbia River Highway was dedicated with much fanfare. The highway is still famous, cherished by millions of visitors over the past century for its careful attention to the landscape and surrounding Gorge scenery. Perhaps most iconic are its string of graceful bridges. The original highway bridge at McCord Creek was completed in 1915, and while it wasn’t as graceful as some of the more famous arched bridges, it was nonetheless a spectacular structure. Early travelers not only had a front-row view of Elowah Falls on McCord Creek, but also a sweeping vista across the Columbia to Beacon Rock and the mountains that rise along the Washington side of the Gorge. The original McCord Creek Bridge was among the longest along the old highway at 365 feet. 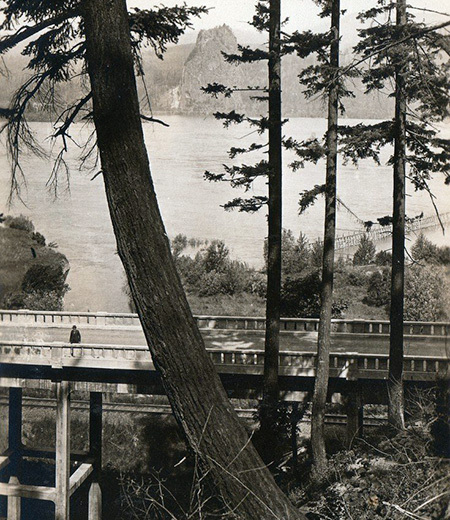 The old structure was durable enough to be incorporated into the first “modern” highway in the Gorge in the 1950s, when much of the original Columbia River Highway was bypassed. The original McCord Creek Bridge was simply expanded to carry the wider road, and later a twin structure was built to accommodate the development of today’s freeway. The original bridge structure was finally replaced in 1987 with a new bridge, after 70 years of service. By the 1930s, the New Deal programs of Franklin D. Roosevelt’s national recovery effort brought the Civilian Conservation Corps (CCC) to the Gorge. Many of the trails we enjoy today were built — or rebuilt — by the CCC, including the McCord Creek trail. 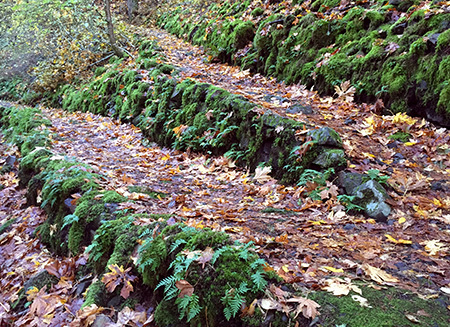 The CCC crews were expert trail builders, and made quick work of the steep Gorge slopes with carefully graded switchbacks constructed with miles of hand-built, rustic stone retaining walls. The original trail at McCord Creek began at the east end of the old highway bridge, traversed to dramatic viewpoints of Elowah Falls, then crossed McCord Creek to climb the east shoulder of the canyon to the upper falls. It was here that the CCC trail builders seized upon the route of Myron Kelly’s penstock conduit around the towering cliffs above Elowah Falls. 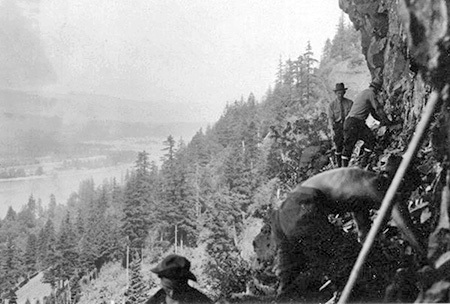 The photo above shows crews clearing the ledge in 1936 to repurpose the route as a bold new hiking trail. The galvanized steel handrails that now give some assurance to hikers along this airy catwalk are not mentioned in a fairly detailed 1936 Daily Oregonian story describing the new trail. These were probably added in the 1950s, when similar railings were installed in other parks around the Gorge — and it’s easy to see why this retrofit was needed as you walk along the 300-foot brink! 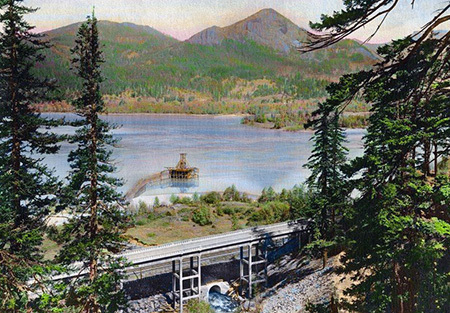 The 1936 Daily Oregonian article also mentions one of the more famous features of the area during the early days of the Columbia River Highway. 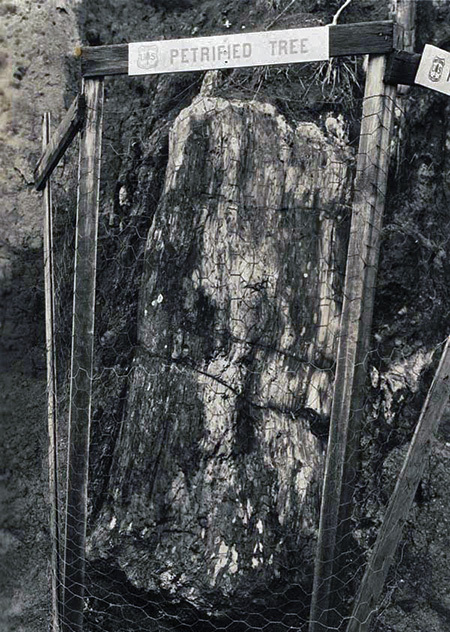 The McCord Creek Bridge construction in 1915 had unearthed a large petrified tree near the east end of the bridge, embedded in the road cut. The tree became a popular feature along the old road, and also marked the start of the McCord Creek trail. The whereabouts of the petrified tree are unknown today, as it must have been moved (or destroyed) when the modern highway was constructed in the 1950s. 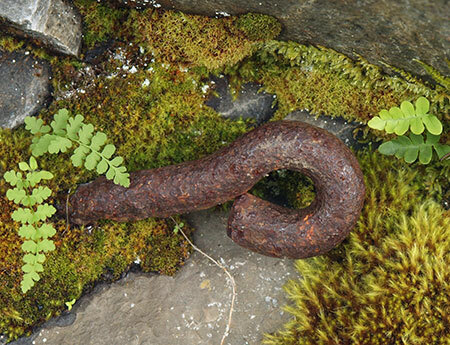 Curious Gorge author Scott Cook speculates that it may have found its way to Cascade Locks, where a petrified log now sits on display at the Marine Park. Petrified logs are not uncommon in this part of the Gorge, however, so the fate of this most famous log may never be known for certain. Update: Scott Cook has located the petrified tree! It was apparently shipped to the University of Oregon Natural History Museum when the modern freeway was built, and placed next to a replica of the Willamette Meteorite. Scott tells me that ODOT historic highway staff approached museum officials a couple of years ago about moving the tree back to its original home (of a few million years), but it’s unclear if that idea gained any traction. The beautiful new McCord Creek bridge sure seems like an appropriate home for the old tree! Stay tuned – I’ll report any news on the subject as it comes. 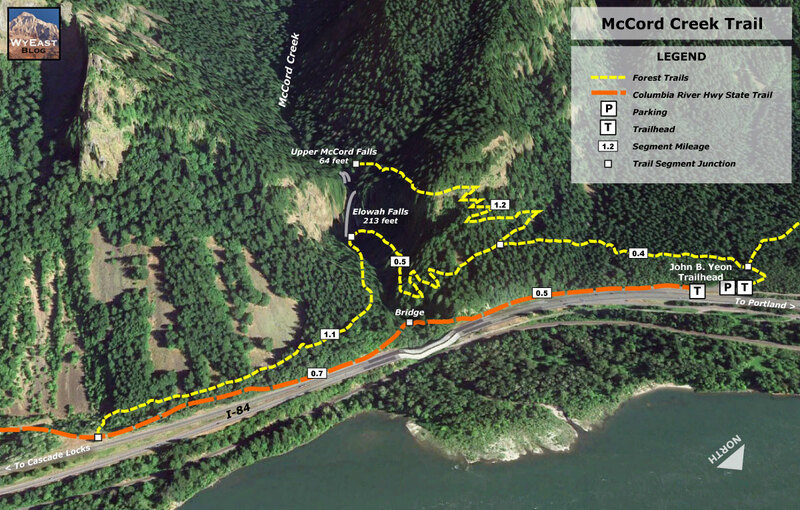 The human history of the McCord Creek area has taken another dramatic turn in recent years with the construction of the Historic Columbia River Highway (HCRH) State Trail. The new bike and pedestrian route is an ambitious, decades-long effort by the State of Oregon to restore lost sections of the original highway, eventually re-connecting the entire original route from Troutdale to The Dalles. 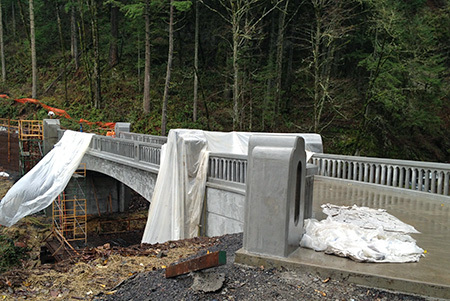 In 2012, construction of the HCRH State Trail section from John B. Yeon State Park to Tanner Creek was in full swing, and featured a handsome new bridge over McCord Creek that rivals the original highway bridges in its design and attention to detail. The completion of this new segment of the HCRH State Trail has opened loop high opportunities in the McCord Creek area, as well as the opportunity to bike and hike — as described below in this article. Now that you know some of the history of McCord Creek, it’s time to explore the trail! This is a half-day hike for most, so makes for a great option during the short days of winter, when most higher elevation trails are snowed in. It’s also a great family hike, with lots to look at and modest grades throughout, thanks to careful design by its CCC builders. Like most Gorge trails, the hike has cliffs, poison oak and ticks, so keep an eye on small kids, leash your dog, learn to identify and avoid poison oak and do a tick check when you get home. One of the added advantages of doing this hike during the winter months is that poison oak leaves have dropped, greatly reducing the possibility of bringing home an itchy rash from your hike! Ticks are also much less active in winter — and not particularly prevalent in this particular area — though you should always do a tick check after hiking in the Gorge. The hike starts at the John B. Yeon trailhead (driving instructions at the end of this article), and after passing the old wooden cistern mentioned above, you immediately reach the first poorly-signed junction. The trail to the right heads off to Nesmith Point, so continue straight (left) instead, past an empty signpost and traverse above the trailhead parking area. Soon, the trail begins a very gradual climb on what is actually an old roadbed, now just a very wide and rustic path. This section of trail was opened sometime after the modern freeway was constructed in the 1950s, and the original trailhead for the McCord Creek trail relocated from its old location on the east side of the creek. At about one-half mile from the trailhead, the old roadbed ends at a “T” junction with the original CCC trail and another confusing signpost. From this point in the hike, the trip has two forks, with up-and-back spurs to follow, one to each of the two waterfalls. The best way to enjoy the hike is to go right at this junction, and continue climbing toward Upper McCord Creek Falls as your first destination. As you climb the 1.2 miles to the upper falls, watch for the beautifully constructed stone retaining walls that line much of the trail. They are now cloaked in moss and licorice fern, but have held up amazingly well since the stones were first placed almost 80 years ago by CCC workers. After several switchbacks through steep forest, you will encounter the remains of the old pulp mill penstock pipes. One is located at the end of a switchback, the other crosses the main trail. Look closely at the second pipe, and you can see the doomed efforts of some early trail crew to actually cut through the surprisingly solid pipe! Up close, you can also see the thousands of rivets used to assemble pipes of this kind in the late 1800s in a way that could withstand the intense water pressure. The trail passes through a couple more switchbacks beyond the penstock pipes before reaching the spectacular and exhilarating catwalk section, some 300 dizzying feet above McCord Creek. The handrail makes this section very safe, so take the time to look for traces of the old mill conduit that once carried water from McCord Creek around this ledge — there are old bolts and bits of pipe if you watch closely. The views from the cliffs are also impressive. On most days, Aldrich and Table Mountains on the Washington side of the Columbia River dominate the horizon, but on clear days, the very top of Mount Adams can also be seen. Further on, the catwalk section of trail also allows a birds-eye view of Elowah Falls dropping into its huge amphitheater, far below. The catwalk portion of the hike ends abruptly when the trail disappears into the lush upper canyon of McCord Creek. Just a few steps into this beautiful rainforest, the view suddenly opens to the twin cascades of Upper McCord Creek Falls. This is an idyllic spot to stop for lunch and photographs. The trail continues a few hundred yards to the edge of McCord Creek, just above the falls, where the intake for Myron Kelly’s pulp plant was apparently located. To complete the second leg of the hike, retrace your route down to the “T” junction and continue straight (right) in a traverse across a mossy talus field. Soon, the trail abruptly drops into the lower McCord Creek canyon with another series of switchbacks. In this section, you’ll see old cable railings at an overgrown viewpoint that dates to the 1940s or 50s. You will also have a view down to the new McCord Creek Bridge on the HCRH State Trail, far below. 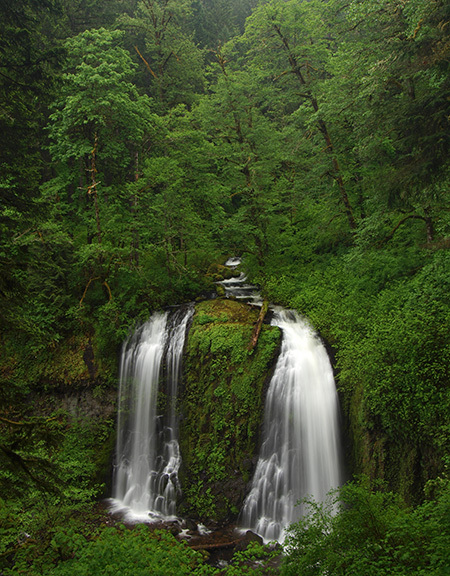 The lower trail soon traverses above noisy McCord Creek before arriving at the spectacular base of 213-foot Elowah Falls. The trail crosses the stream on a wooden footbridge here, and during the rainy season, expect to get wet — the spray is impressive! You can do the fragile canyon ecosystem at Elowah Falls a favor in this area by not scrambling up the various boot paths that have formed here. Most are dead-ends left by hiking newbies that go nowhere, but are beginning to have an impact on the landscape. Instead, there’s a better way to visit a lesser-visited viewpoint of the falls. Simply continue beyond the footbridge and begin traversing downstream along the canyon for about one-quarter mile. As the trail begins to curve away from the stream, watch for an obvious path on the right and above the main trail. This is a bypassed section of the original trail, and it’s in excellent shape for exploring. You can follow the old tread past a couple of switchbacks, then to a fork, where a short spur leads left to a spectacular, boulder-top view of the Elowah Falls, framed by bigleaf maples. The main portion of the old tread continues a bit further, then dead-ends at another great view of the falls, where you can also see the modern trail and footbridge, below. If you do explore this abandoned section of trail, please stay on the tread — it’s obvious and easy to follow, with much of it still lined with CCC stone retaining walls. In recent years, boot paths to the viewpoints on the old trail have formed from the modern trail, below, so be sure not to reinforce these and simply retrace your steps along the old route to return to the main trail. 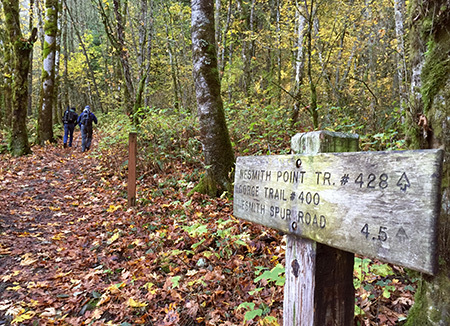 If you’re looking for a longer hike and more variety, you can also continue east from Elowah Falls for about a mile to the newly completed HCRH State Trail, where you’ll find a signpost marking the junction. Turn left on the wide, paved trail and follow it 1.2 miles back to the Yeon Trailhead, passing the impressive new McCord Creek Bridge along the way — another nice stop along the hike. This section of the new HCRH State Trail is noisy, as it follows the freeway closely, but it’s an interesting and new way to appreciate the Gorge from a different perspective. From Portland, take I-84 to Ainsworth (Exit 35), a few miles east of Multnomah Falls and the eastern access to the drivable western section of the Historic Columbia River Highway. Turn left at the first intersection, then almost immediately turn right onto a frontage road where signs points to Warrendale. From here, continue east on the frontage road to the Yeon State Park trailhead, where the frontage road terminates at an eastbound freeway ramp. To return to Portland, follow the frontage road west to the Ainsworth interchange, and follow signs to Portland. No trailhead permits are required here, and no restrooms or water are provided (note: water and restrooms are available just west of the Ainsworth interchange, at Ainsworth State Park). Dogs must be leashed in this state park! At least two dogs have had to be rescued by search and rescue teams in the Gorge after falling from cliffs this year because of careless owners who took exception to posted rules. Please set an example and respect this rule… and enjoy your trip! Special thanks to Scott Cook for his help on this article! Be sure to pick up a copy of Scott’s new guide to Portland: PDXccentric: the odyssey of Portland oddities! You can learn more on the PDXccentric Facebook page.